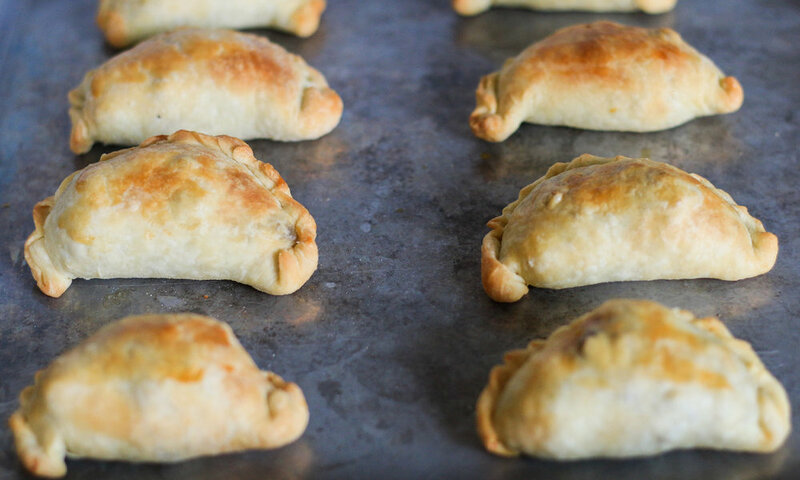 What’s not to love about empanadas? 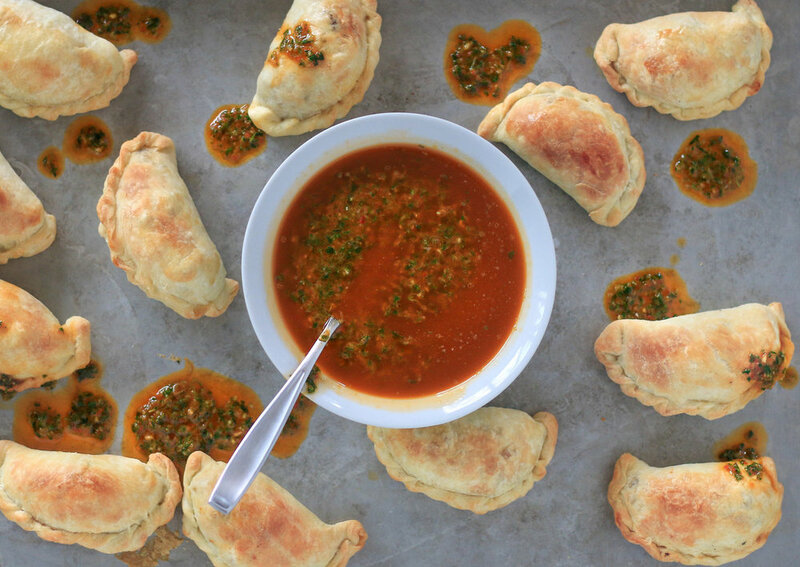 Flaky hand pies stuffed with whatever your heart desires. I made traditional Argentinean empanadas because my boyfriend is Argentinean and I knew he would love them. They are filled with ground beef, hard-boiled eggs and green olives and are usually served with a chimichurri sauce. Feel free to get creative with your filling. Only thing to be careful of is using a filling that is too wet because they may break open and leak while they are baking. Sift flour and salt together in a large bowl. Using your fingertips, blend together the butter and the flour until a coarse meal is achieved. The pieces of butter should be no bigger than the size of a pea. In a separate bowl, whisk together the egg, water and vinegar. Pour the egg mixture into the flour and stir with a fork to combine. At this stage the dough will not be holding firmly together on it’s own and will look quite shaggy. Turn out the dough onto a lightly floured surface and knead until the dough comes together and you can form it into a flat disk. Do not over work the dough. If the dough is too dry, add water 1 tbsp. at a time or if it is too wet add flour in 1 tbsp. at a time. Wrap the disk in plastic wrap and refrigerate for 1 hour or overnight. Melt butter and oil in a large fry pan over medium heat. Add onions and cook until soft and translucent. Add garlic and sauté until fragrant, approximately 1 minute. Add ground beef and cook until lightly browned, breaking up the meat with a spoon along the way. Drain fat. Stir in paprika, cumin, hot sauce and salt and pepper. Let mixture cool and then mix in chopped oregano. Lightly flour a clean workspace and divide your dough into 4 pieces. Using a rolling pin, roll out each piece so that it is approximately 1/8 inch thick. Cut the dough into 6” circles. Fill each circle with 1 tablespoon of the meat mixture, 1 slice of hardboiled egg and 1 or 2 sliced olives. Fold the circle in half, forming a semi-circle and seal with your fingertips. Twist the edges to form a more secure seal. Trying to explain the motion is much more confusing than it actually is. I watched this quick video to learn how to make them look oh-so-pretty: https://www.youtube.com/watch?v=R_cQ19dvxk0. Preheat the oven to 400F and place one rack in the top third of the oven and the second rack in the bottom third. Brush the empanadas with the egg wash and bake them for around 25-30 minutes (until golden brown), switching the positions of the trays halfway through baking. While the empanadas are baking, blend all ingredients “for the chimichurri” in a food processor or with an immersion blender. Once the empanadas are done baking, transfer them to a cooling rack for 5 minutes. Serve with roasted red pepper chimichurri and hot sauce.